The code base of the 1.12 version of BQ is changing so often due to the ongoing BQ3 conversion that it would break expansion compatibility constantly. Having to keep updating more expansions than necessary would be somewhat of a waste of time that could be better spent elsewhere. Not saying I won't update it ever but rather I'll wait till there's a stable stopping point where I can update a large chunk of stuff without risking a compatibility breaking change for a while. Ok, so there might be an update after BQ3 is released. No problem. Took a year of work but I think it was worth the wait considering how much more powerful BQ has become under the hood. Still plenty of ongoing work to do but it at least will be fairly easy to update things now. Back porting is still quite a ways off though. I added a quest that requires RF/tick, placed a RF submission station, connected cables to it and supplied plenty enough RF/tick. But neither can i fullfill the quest directly (detect/submit button) nor do anything in the submission station. There are 2 rows with selection buttons at the top of the stations GUI but nothing i can select there ? just wondering when you are updating this addon so its compatible with bqm 2.3+? Could you add support for the EU and Tesla? Someone's welcome to make another expansion for these but I personally don't support Tesla's encouragement of power creep. The only other power supply I will be supporting is Forge Power which will come sooner or later. Well that was a bad question, let me take it back. -Any plans to have an individual EU questing device? 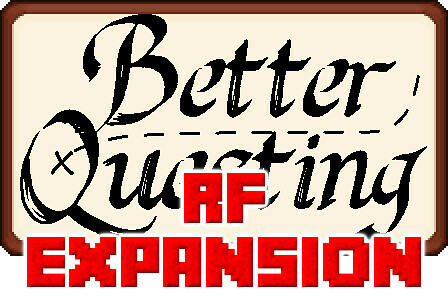 I don't intend to be the only developer who makes all the integrations and expansions for Better Questing. 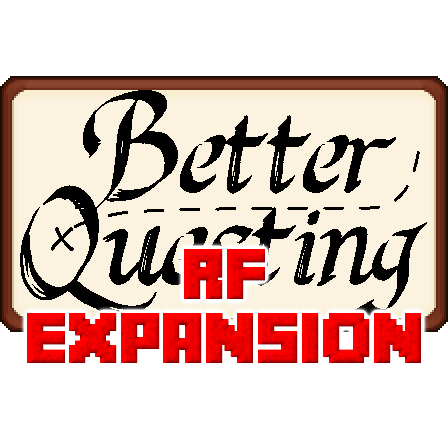 This expansion is a proof of concept for supporting power based quest lines and because RF is the most widely used format, it was only natural for me to support it. If anyone absolutely needs support for more types then they are welcome to make more integrations themselves or find someone else to make it. Can you add permission to include this mod in a modpack? Currently it is All Rights Reserved with no permission stated. Done, also added permission for other expansions. Why is this not in the original mod? Because it allows me to update each module individually instead of spamming the base mod with updates unrelated to features not everyone may be using. It also means that expansions with mod dependencies can be omitted if not in use (like the NPC expansion). "spamming the base mod with updates" What do you mean exactly? "xpansions with mod dependencies can be omitted if not in use"
1) If I have to fix or add tasks/reward types to an expansion it means only the people actually using the expansion have to update. Developers other than me are also using the base mod to develop their own integrations so constantly updating that for unrelated issues would be annoying to them. If you have such a problem with the modular setup of BetterQuesting, feel free not to use it.